This year I served as the Oral Health Educator for Erie Family Health Center. Erie is a community based healthcare clinic that serves low-income residents of Chicago. Most are under-insured or not insured, and the demographics of our patients are 80% Hispanic, 10% Black, and 10% other. As a health educator my main role was to go out into community centers, schools, and Head Start programs to present on the importance of good oral health. Because of this outreach, I have driven all over the city of Chicago. This has given me a very diverse perspective of the city. I have worked with classes of 15 and classes of 45. I have seen kids with mouths full of silver teeth and parents that have not been to the dentist in five years. I think that I have a much more holistic view of the neighborhoods and people of Chicago now than I did last year. Throughout my time I have been both inspired and disheartened. I have only begun to understand some of the deeper root causes of the poor oral health of so many Chicago natives. Kids tell me over and over again how they love soda pop, eat McDonald’s, and have a bag of hot chips after school every day. The nutrition messages I am sending sometimes seem completely lost on these kids because their parents are not reinforcing good behaviors. I am also disheartened as I talk with parents and realize that important oral health messages are sometimes completely foreign. So, I am helping a few parents learn more, but I am just one small person. There are so many more parents who do not attend parenting meetings and will continue to buy McDonald’s weekly. Or, maybe this is all they can seem to have time for or afford, despite what they might want. Many people also lack dental coverage. There are so many reasons behind the poor oral health of many Chicago families. I am inspired, however, by the parents that I work with. They ask important questions and tell me that they have learned so much. I am inspired as the kids I teach begin to answer my nutrition questions correctly, and give me huge smiles and hugs as I leave. Lastly, this year has inspired me to continue my work to improve the health of others. Next year I am going to begin medical school, and I hope to continue working in the neighborhoods that are most in need of medical care. Because of my time as an AmeriCorps member with Amate House, I will continue a life of service. Lindsay Williams is from St. Paul, MN and is now living in Omaha, NE. She is currently finishing up her first year at Creighton University School of Medicine. Last year, she served as an Amate House Volunteer and AmeriCorps member as an Oral Health Educator at Erie Family Health Center in Chicago. This summer, she led a medical service trip of 7 students to the rural Northeast region of India as well as Calcutta for 5 weeks. 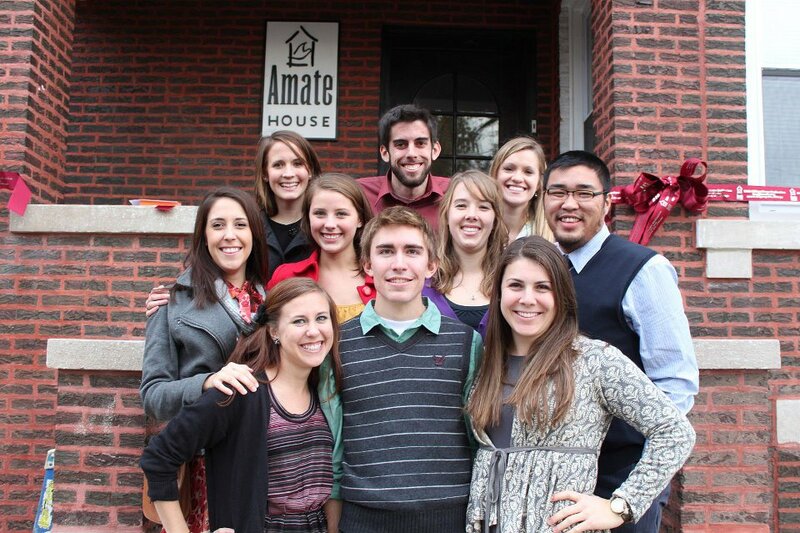 Amate House, the young adult volunteer program of the Archdiocese of Chicago, fosters the transformation of its volunteers by providing experiences of full time service to people in need, community living, and faith formation. Amate House develops future leaders for the church and world who are committed to building a more just and loving society.